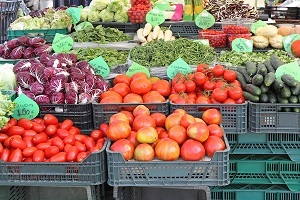 PICS - Produce Inventory Control System software is all about buying, selling and effectively tracking, tracing, inventorying, and reporting on produce. The Produce Inventory Control System (PICS) is a robust and reliable software solution that has been specially created for companies in the fast paced produce industry to improve operations, traceability and profitability. Traceability is more than a "buzz word" today – it's a must! Production types - will allow "many to many" work orders (i.e. numerous items combined together to make 2 or more output items). It will of course also handle "many to one" and "one to one" work orders. The system will allow regular lot or static lot items to be used as inputs or outputs. Costing - Cost flows from the original purchase orders through the work orders, right down to the finished items, even if there are multiple work orders in between (i.e. head lettuce gets made into shredded lettuce, and then in another work order, the shredded lettuce is combined with other items to make salad). A "Close" button on the work order runs the final calculations and update the costs of all output items once the work order is finished. Bill of Materials - The work orders will be set up initially either manually, or by selecting from a list of "bill of materials". Any work order can be "saved as" a Bill of Materials as well, in case that particular Production needs to be run again. Inventory - When work orders are saved, the quantity of the output items are shown in the inventory as "being produced". And the quantity of the input items are shown in the inventory as "to production" and their available for sale balances are be reduced. As postings are made to the work order to bring more raw materials (inputs) in, and/or to take away the finished goods (outputs) as they are made, the inventory is updated in real time. Labour - the system allows the set up of employees and their various rates of pay. The system will allow you to select which employees worked on a work order and how many hours/minutes they worked on it. When their time spent is factored by their pay rate(s), the cost of labour can be added to the cost of the output items as well. Track work orders from receipt of seed through planting and harvesting to final sale of finished product with full traceability throughout. Can automatically fill the vendor or purchaser from the Customer selected. Reports weights in LB and/or KG. Simply, easy to use Brokerage Order entry screen which is consistent and fully integrated with other screens in PICS. Click here for information on: Operating system , Networking, Disk storage, Printers, Barcoding and Wireless requirements, and helpful advice for IT Professionals and System Administrators responsible for supporting PICS.